Watching the sunset from Phra Prom Lookout above Promthep Cape. One of the great things about traveling and renting motorbikes is the awesome feeling of freedom it gives you! Another is the overwhelming rush. Weaving around other motor bikers, cars, trucks, and buses, sometimes driving up on to a sidewalk to get around traffic, dodging potholes at 100 kph, these are the things that make your heart beat faster and faster! It’s knowing that any mistake at any time, could be life-threatening. That is all part of the incredible rush that you get when you ride a motorbike around SE Asia! I became addicted to that rush, and now I will rent a bike whenever the opportunity arises. 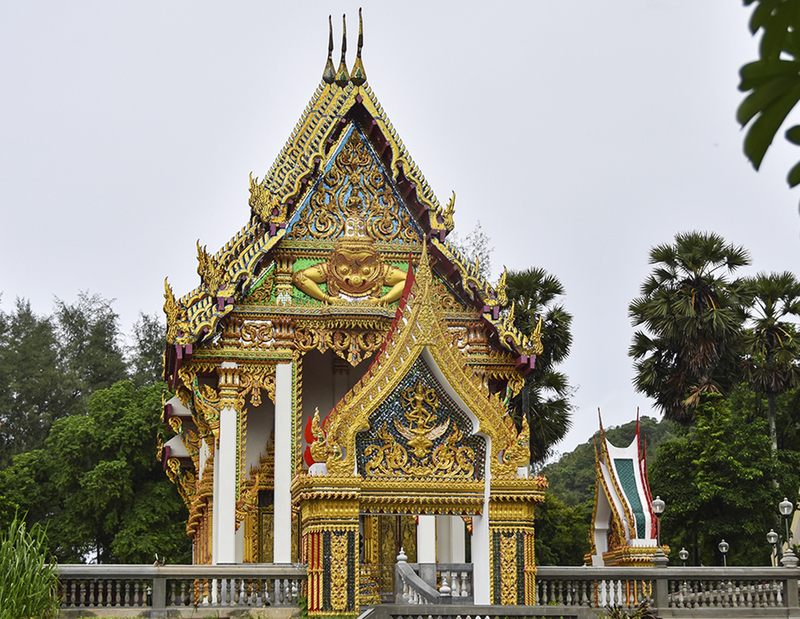 The island of Phuket has so much to see, and the best way to do that is to rent a motorbike. It makes it SOOOO much easier to get around. Buses are cheap on the island, so you can still get to all the beaches if you don’t rent a bike, but you are limited to their time frame, and many of the buses stop running after 5:00 pm. After that you are either stuck paying for an expensive taxi, or staying overnight wherever you happen to find yourself. One of the first trips I went on after being handed the keys to my rental bike was to Rawai, and Promthep Cape. They are quite near each other, and in fact if you are coming from Phuket Town like I was, you just about have to go through Rawai to get to Promthep Cape. Both of these places are definitely worth a visit. I actually made several trips to Promthep Cape to take photos. The best time to go is about an hour before sunset. 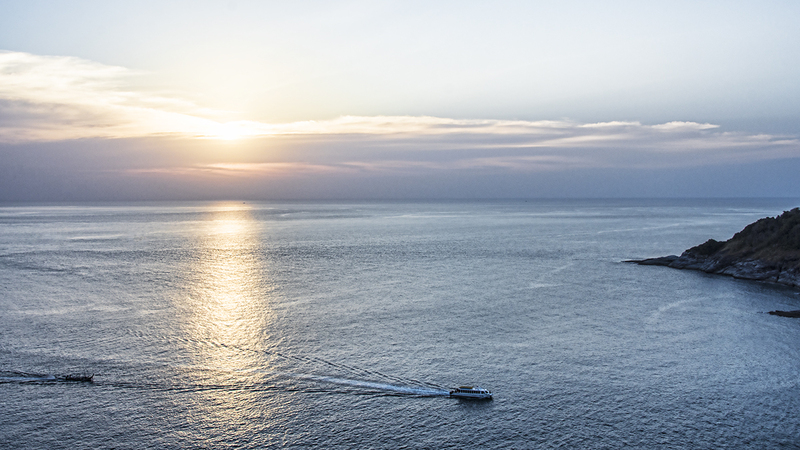 You can look down on the cape, or out at the ocean from Phra Prom Lookout, or Kanchanaphisek Lighthouse. This is for sure one of the best locations on the island to take in a sunset. Then, after catching the beautiful views, Rawai beach would be a great destination if you travel on more of a budget than I do, to take in a seafood dinner. I am definitely cheap, but one of these times I am going to splurge and try one of these restaurants. They are across the street from the ocean, but have tables along the shoreline, which is an excellent place to sit at dusk and relax. I have read there are pretty good bars to hang out, have a beer, and listen to some music, if one were to want to do that. 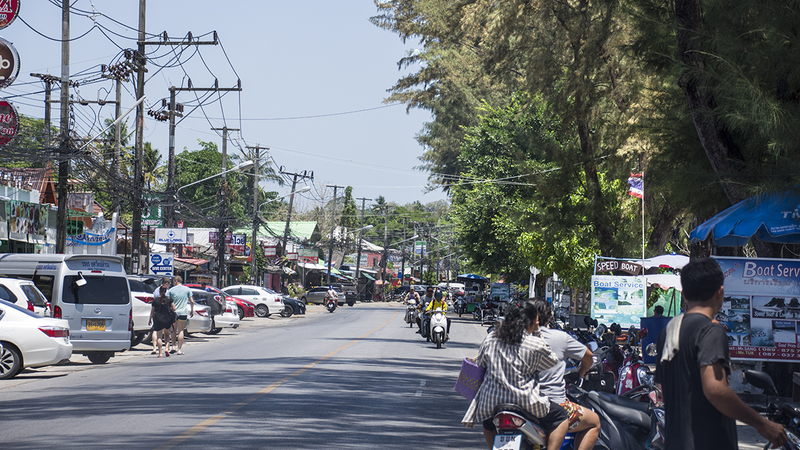 I really like Rawai, it seems like a pretty laid back, fun town. Rawai beach is not for swimming, too many boats! 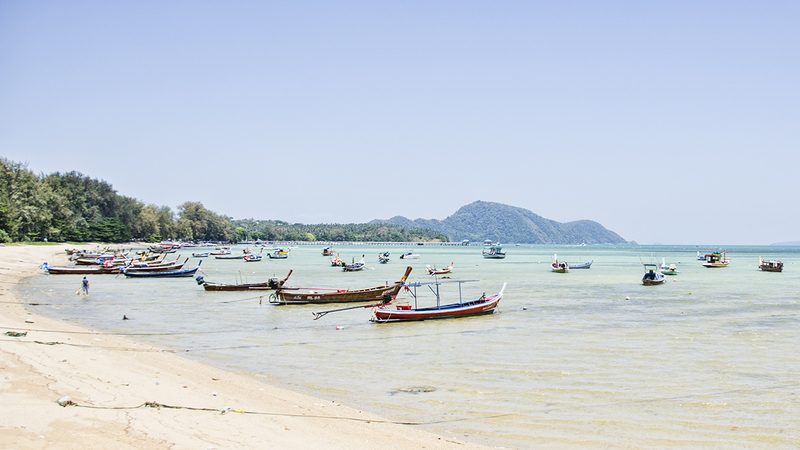 Rawai is also a place to come back to and take a speed boat or a long boat to one of the neighboring islands. This isn’t a beach for swimming though, but just up the road, not far from Promthep Cape is an excellent beach for that! 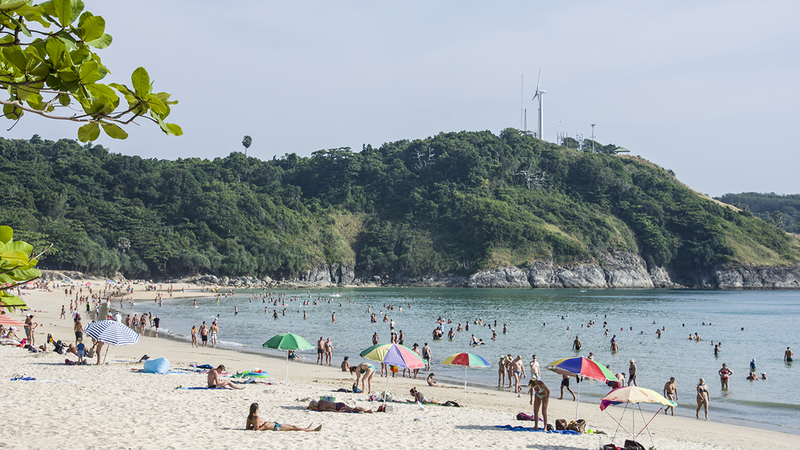 That beach would be called Nai Harn, and it is definitely one of my favorite places to swim on Phuket, although I am a bit hesitant to say that, since there are so many great beaches on the island. It does get a bit crowded during the high tourist season, but as you can see in the photo below, it isn’t too bad. Beautiful Nai Harn Beach, a great place to hang out! I would also recommend this beach for capturing nice sunset shots, and I actually came here a couple of different times to take photos. In addition to great swimming and beautiful sunsets, there are several small seafood restaurants right along the beach, a couple of places to get a massage, and two hotels within a very short walking distance! I might actually step up and pay a little extra to stay at the cheaper of the two for a night, the All Seasons Hotel. The ratings on TripAdvisor aren’t too bad, and they include a free breakfast which is always nice! 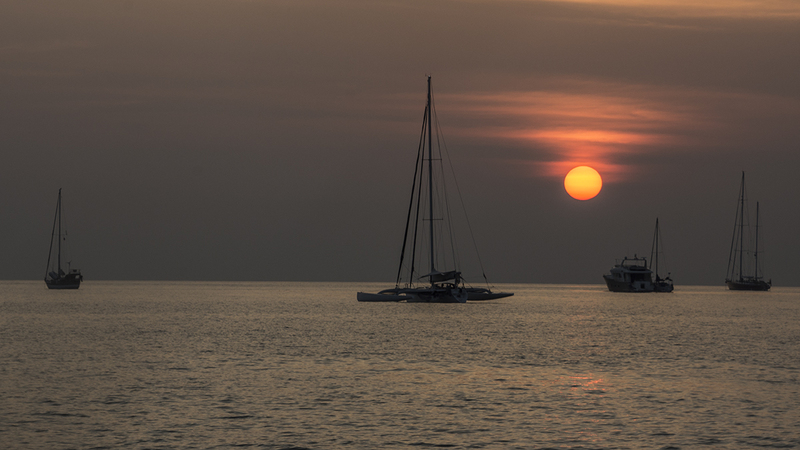 Looking out at the sunset on Nai Harn Beach. Also nearby is a beautiful Buddhist temple, a large water reservoir to walk around, and a nice little outdoor exercise park for free to get your sweat on. Not too far away, within a mile or so, is the small town of Nai Harn, where you can find more foodie opportunities, along with other hotels and guest houses. It’s a nice little town, and worth a walk around. I will always be coming back here whenever I come to Phuket. This place definitely gets two thumbs up from me, and many of my friends on the island love this area, too! 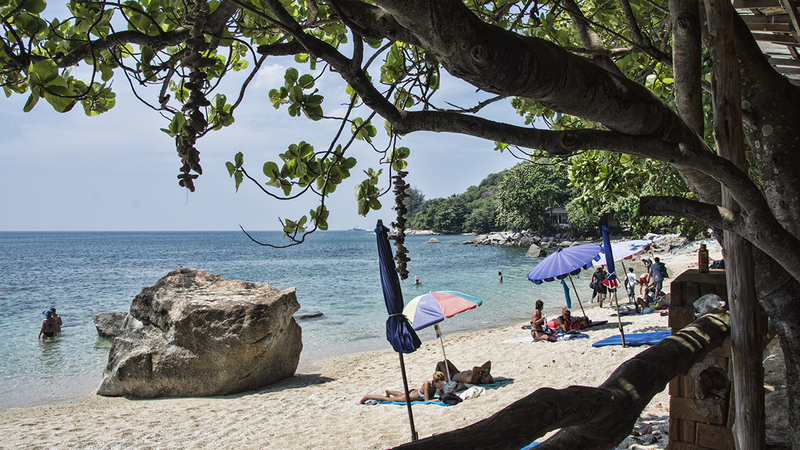 Just up a narrow, dead end road past The Nai Harn hotel, the more expensive, upscale hotel, you will find Ao Sane Beach. I would like to mention that the road is VERY narrow for a two lane road, and on the ocean side of the road you will find a cliff. This road is best traveled by motorbike, but people do drive cars there, too. Parking is very difficult at this location. I met a fellow traveler that had a very bad experience trying to maneuver her car down this road and park it in the limited space. There is more parking down below for motorbikes next to the beach, but the driveway down there is very steep, and it scared me a bit riding my bike down there and then having to get back up! This beach does have a restaurant, and their food is good and reasonably priced! The restaurant can also rent you snorkels and flippers if you don’t have any. Divers frequent this beach as there is a local dive shop. One thing to watch out for at this beach though, is when the tide is changing. There are a lot of barnacles on the rocks, along with some coral, and you can get sliced up with the water throwing you about. On one of my trips there when the tide was coming in, I sliced my stomach up pretty good and decided after a few minutes that I needed to get out of the water and come back another time. 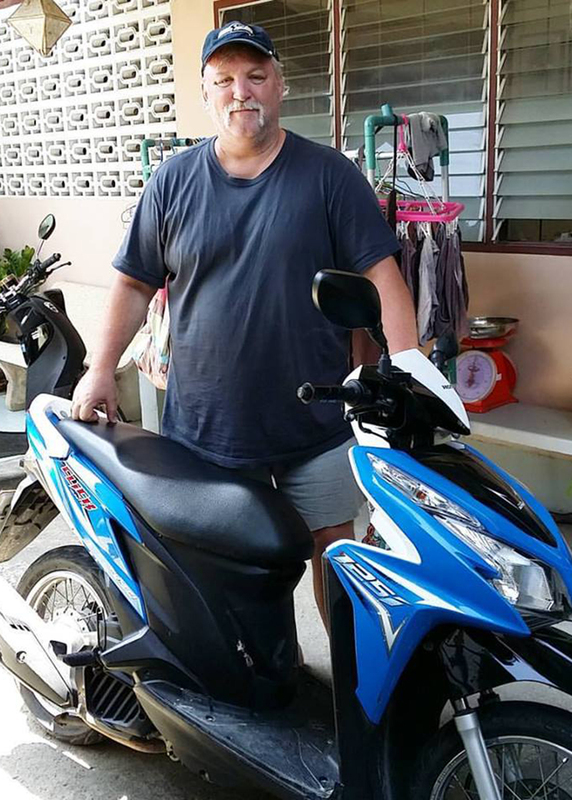 I felt pretty good about my first day or two of traveling around on my motorbike. I had been able to take some nice photos, gotten some good video footage (which I will be posting more of in the future on my You Tube channel), and hung out at some pretty amazing beaches and viewpoints. I made it a goal to try to travel to all, or at least most of the beaches on the west coast of the island, and this had been a pretty good start! If you keep following my blog, I will tell you about more of these world class beaches in the coming weeks.Now, it’s time to get out of your comfort zone, and make yourself feel alive by taking a trip somewhere, and following in my, or some other traveler’s footsteps! As Nike likes to say, just do it! 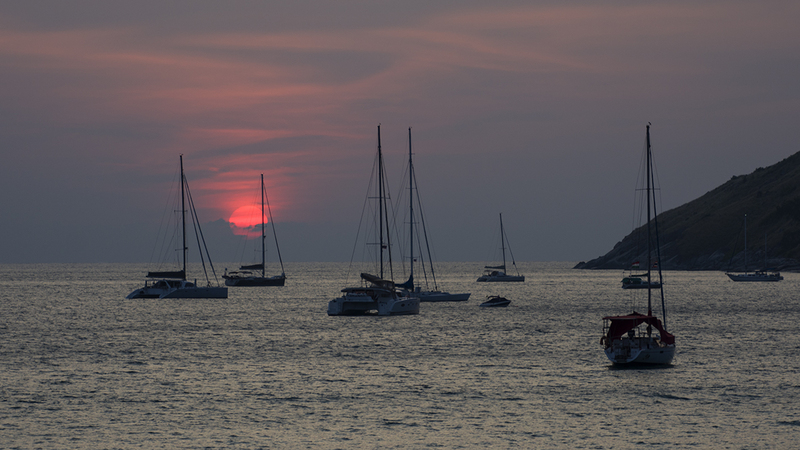 Another great sunset at Nai Harn Beach. The sunset shot is great. Jay!. This makes me want to go to the beach, I haven’t been to one since september last year! Uhhh!! I have been sleeping for the past two weeks and missed your comment, Leah, haha. Well, it will be a lot longer until I can get to a nice beach like the beaches in Phuket, you will definitely get there sooner than I will! Oh how I miss them now, too. Thanks for the comment, Leah!